Every garden should have waxwings! With a little planning, you can bring in these gorgeous fliers with colorful fruit-bearing plants that attract birds. The flowers attract butterflies while the fruit brings in waxwings and other fruit-loving birds. Watch for the beautiful red leaves in fall. June-bearing varieties produce one bumper crop per season. If you want several crops, try growing day-neutral or everbearing varieties. Why we love it: There’s always room for strawberries, since you can grow them in the ground, in hanging baskets or in container gardens. The red berries of this deciduous holly brighten gray or snowy winter landscapes. Be sure to plant at least one male for every five female plants so there’s fruit for the waxwings to feast on. Combine winterberry with evergreens and ornamental grasses for a pleasing winter scene. The plant is tolerant of wet acidic soils. 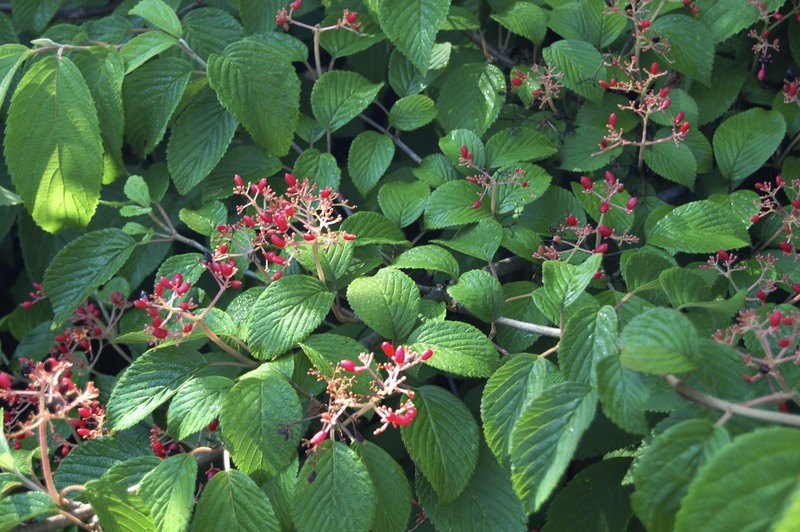 Why we love it: A few berry-covered branches will do wonders for your winter container gardens. From tall and slender to low and spreading, juniper comes in a wonderful diversity of shapes. The prickly evergreen needles provide shelter, while the berrylike cones offer food for the birds. Needles can be green or bluish-green and may be tipped in white or yellow. Some turn bronzy-purple for winter, while others remain green to brighten the landscape. Why we like it: There’s at least one type of juniper that will grow in just about any part of the world. Also know as juneberry or shadbush, this four-season beauty provides white flowers in spring, fruit in June and great fall color. When the leaves drop, they reveal beautiful smooth gray bark. Both tree and shrub forms are available in average heights of 3 to 25 feet. Why we love it: You can enjoy this edible fruit, too. It tastes like a nutty blueberry. Include these small-scale plants in mixed borders, mulched beds or near other plantings where their beauty can shine but you’re protected from the thorns. Or select one of the thornless varieties for use near pathways and children’s play areas. Hawthorn’s white flowers are pretty to look at (but not to smell), and its drought tolerance makes it a good addition to water-wise gardens. Why we love it: The fruit-laden horizontal branches are breathtaking in winter. Everyone loves crabapple’s lightly fragrant white, pink to rosy-red spring flowers, but consider the colorful fruit, too, when choosing one. Look for fire blight- and scab-resistant varieties to increase the beauty and reduce maintenance. Why we love it: There are so many choices! Upright, weeping and spreading forms are available with yellow, orange or red fruit. You may know this broadleaf evergreen for its elegant form and reddish-brown bark, but the waxwings know madrone for the reddish berries. The dark green leaves make a striking backdrop to the white flowers. Plant it in a mixed border or mulch bed to minimize leaf and blossom cleanup. It prefers warm, dry locations. Why we love it: Madrone’s berry clusters may include red, orange and yellow fruit at the same time. The North American native and European mountain ashes are small-scale trees that work well in mixed borders and less-than-spacious landscapes. Mulch the soil to keep the roots cool and moist. Proper care is critical to keeping this tree free of pests and looking its best. Why we love it: Your extra effort in caring for this plant will pay off when the flock of waxwings feasts on the fruit in fall or early winter. The fragrant white flowers add a bit of aromatherapy to the garden, while the fruit attracts the birds. Include elderberries in your shrub plantings and perennial gardens, or use this suckering plant to help stabilize slopes and riverbanks. Regular pruning will keep it looking its best. Why we love it: If you have any berries left after the birds get their fill, you can use them to make your own jam, jelly or wine. Yes, raspberries are delicious, but share some with the waxwings! These vigorous plants make a great hedge, screen or barrier plant in the garden. Proper pruning will increase productivity and reduce pest problems. Why we love it: Summer- and fall-bearing varieties guarantee that you and the birds will have plenty of fruit to enjoy. These are not blueberries. They appear to be some kind of viburnum. Number 1, blueberries don’t grow like that, and number 2, Amelanchier, Juneberry, Shadblow, whatever you want to call it, doesn’t grow this way either. Whomever posted this needs to know their plants/trees/shrubs before they post pics. It is a lace leaf sambuca, not viburnum. Variety of elderberry , I have one looks just like this, the scene it’s intoxicating in the spring . I trained mine into a small tree, about 10 ft.
Are all/any Junipers edible for humans? Juniper is a member of the cypress family and it is the only one with edible fruits. Its most well known use is in the making of gin. I’ve also seen it used as a spice for wild game, for pickling and as a marinade..
Now that is one bird I have never seen and would like to. I had a mountain ash for years, but flocks of robins gobbled the seeds so fast, no others had a chance at them. Cedar waxwings also love the berries on cedar trees. I thought that was where their name came from. We have them here in Virginia as they are migrating. They usually appear with Robins. They are here now migrating on the coast of NC. In Northern California I had a mulberry tree, and the waxwings flocked to it every spring–they appeared to love the berries. It was worth the temporary mess on the ground. The tree also attracted many other species. If that ad pops up again after I have closed and refused it 10, 10 times I will close down and not return. I would not want these birds if you want fruit to pick from your trees or bushes! Waxwings stole our entire crop of cherries this year and last, as well as our neighbors. They are beautiful and I had always wanted to see one. Now I hope they do not come back! That’s funny, I plant fruit SPECIFICALLY for birds! I just planted two Hansen Bush Cherry plants for the birds. Love my cedar waxwings! If you want to see waxwings plant a female holly tree. We don’t eat holly berries but waxwings & robins love them. I once had a flock of waxwings eating holly berries in Virginia. . . I love eating service berries myself, but in the photo here, neither the berries nor the leaves look like service berries. What are they, really? Looks like some kind of Viburnum to me. We have had flocks of waxwings clean out our holly trees in the past! I have a cedar tree next to my driveway. Every autumn flocks of cedar waxwings eat the berries (Blue/green in color) off the tree. They are such beautiful birds. I am in Coastal NC. Have noticed cedar wax wings also love my fatsia bushes and come in huge flocks to strip the seeds in late winter. Only once was I lucky enough to have a flock of them stop once to eat the juniper berries in our yard during the spring, many years ago. CT shoreline, we don’t get them here, too urban, maybe? The sambucus pictured (purple leaves, pink flowers) is not a native, doesn’t flower well in northern climates (PA and north), and therefore produces no berries at all. The native sambucus may be different. I’m from Central Oregon, have one of those trees and her we call them Juniper Trees. These are still not serviceberries. Change the photo already. Maybe they are the berries of Virginia Creeper, but I don’t see Virginia Creeper leaves. They love the red berries on my Savannah Holly tree, too! alguns fornecedores, possíveis problemas e como resolvê-los.